Pickled mustard green (hum choi ) is one of my favourite Chinese pickle. It's quite versatile, can be used for soup like this duck soup, braising with meat or stir fries. There are various types; some salty, some with a tangy taste, some sweet and sour, some with leaves, some without (like half a cabbage), some with chilli. I don't use those in a tin for cooking, they are nice with plain rice congee. 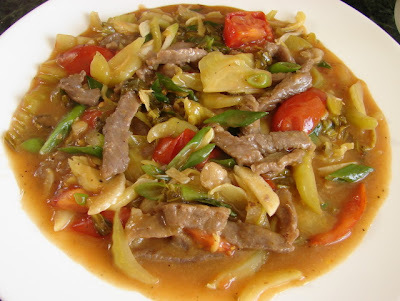 Beef stir fry with pickled mustard green is quite tasty. Recipe is quite easy. Remove fat from the meat, cut into thin slices against the grain. Mix with marinade and leave for 15 - 20 minutes. Cut pickled mustard green into thin strips. Taste if salty, if yes soak for a while then squeeze dry. Cut tomatoes into wedges. Chop ginger and garlic. Sliced spring onion into 1 inch long. In a hot wok add about 1.5 tbsp and half the garlic and ginger, stir till fragrant, heat high and add in the beef and stir till colour change. Remove to one side. Add a bit more oil and remaining ginger and garlic, stir till fragrant add in the pickled mustard green stir fry till hot follow by tomatoes, stir fry for a little while. Add a dash of cooking wine and sugar to taste. Heat turn on highest, add in the beef and slackened cornflour and oyster sauce. Stir till thickened then add in spring onion.